Fish can be cooked many delicious dishes. 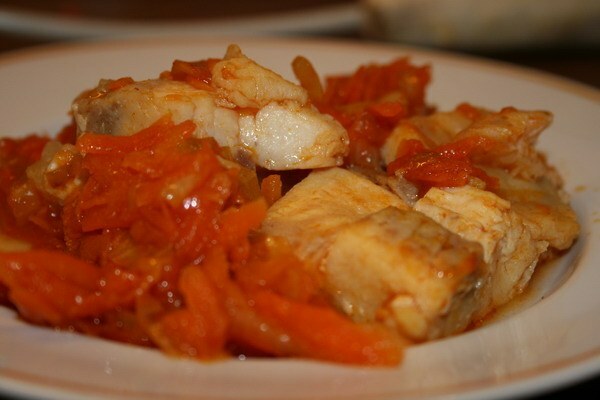 Especially useful is the combination of fish and vegetables. Bake fillets in the oven, boil or try the original and simple version - the fish in the Bank. The dish turns out very juicy and perfect for the diet. Fish cooked in a jar - an unusual dish that for those who prefer healthy and not too rich food. Use the fish any rocks, both simple and delicious. The fat content also can be any. The dish was more tasty, add fish a variety of vegetables: onions, carrots, sweet peppers, tomatoes, zucchini. Interesting flavor nuances will give and herbs. However, too much of spices should not be put, they drown out the delicate flavor of the fish. Before cooking cut the fish into pieces, it is advisable to take out all the bones. The dish can be cooked in the oven or in a water bath. The fish is served hot or chilled as a hearty snack. It can be stored in the refrigerator but not for too long. Try to cook the fish in a jar in a water bath. Diet use low-fat varieties, for example, hake or cod. Cod fillet wash, dry, cut into pieces. Chop the onion, carrot peel and grate on a coarse grater. Tomatoes pour over boiling water, remove the skin, chop the flesh. Squeeze the juice of a lemon, add salt and black pepper. Pour a mixture of fish pieces and leave for 15 minutes. In a deep frying pan heat the vegetable oil. Fry the onions, then add carrots and tomatoes. Stirring, cook everything until the excess liquid has evaporated. The sunflower vegetables. If you prefer a less greasy option, carrots and tomatoes can not fry. Jar wash thoroughly and dry. Heat it in the microwave. Put in the jar half of the vegetables, then fill it with fish. On top of the fillets, place butter and cover with the remaining vegetables. Tamp the mix lightly with a spoon and pour the juice in which it was marinated fish, mixed with a couple tablespoons of vegetable oil. Put on the stove a pan on the bottom lay a towel, pour water and heat it to 60oC. Carefully lower the jar with the fish in the pan so that the water level was above the contents of the banks. Cover with a lid, bring water to a boil and cook the fish for about 20 minutes. Remove the jar from the pan, let it cool slightly and place the fish with vegetables on a plate.